"Rear focal distance" redirects here. For lens to film distance in a camera, see Flange focal distance. The focal length of an optical system is a measure of how strongly the system converges or diverges light. For an optical system in air, it is the distance over which initially collimated (parallel) rays are brought to a focus. A system with a shorter focal length has greater optical power than one with a long focal length; that is, it bends the rays more sharply, bringing them to a focus in a shorter distance. In most photography and all telescopy, where the subject is essentially infinitely far away, longer focal length (lower optical power) leads to higher magnification and a narrower angle of view; conversely, shorter focal length or higher optical power is associated with lower magnification and a wider angle of view. On the other hand, in applications such as microscopy in which magnification is achieved by bringing the object close to the lens, a shorter focal length (higher optical power) leads to higher magnification because the subject can be brought closer to the center of projection. For a thin lens in air, the focal length is the distance from the center of the lens to the principal foci (or focal points) of the lens. 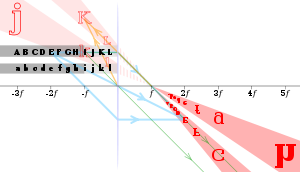 For a converging lens (for example a convex lens), the focal length is positive, and is the distance at which a beam of collimated light will be focused to a single spot. For a diverging lens (for example a concave lens), the focal length is negative, and is the distance to the point from which a collimated beam appears to be diverging after passing through the lens. Front focal length (FFL) or front focal distance (FFD) (sF) is the distance from the front focal point of the system (F) to the vertex of the first optical surface (S1). Back focal length (BFL) or back focal distance (BFD) (s′F′) is the distance from the vertex of the last optical surface of the system (S2) to the rear focal point (F′). For an optical system in air, the effective focal length (f and f′) gives the distance from the front and rear principal planes (H and H′) to the corresponding focal points (F and F′). 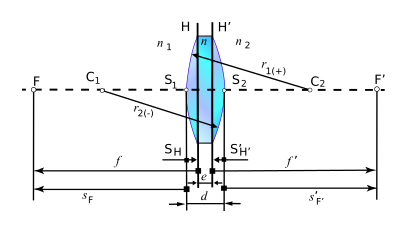 If the surrounding medium is not air, then the distance is multiplied by the refractive index of the medium (n is the refractive index of the substance from which the lens itself is made; n1 is the refractive index of any medium in front of the lens; n2 is that of any medium in back of it). Some authors call these distances the front/rear focal lengths, distinguishing them from the front/rear focal distances, defined above. In general, the focal length or EFL is the value that describes the ability of the optical system to focus light, and is the value used to calculate the magnification of the system. The other parameters are used in determining where an image will be formed for a given object position. where n is the refractive index of the lens medium. The quantity 1/f is also known as the optical power of the lens. In the sign convention used here, the value of R1 will be positive if the first lens surface is convex, and negative if it is concave. The value of R2 is negative if the second surface is convex, and positive if concave. Note that sign conventions vary between different authors, which results in different forms of these equations depending on the convention used. where R is the radius of curvature of the mirror's surface. See Radius of curvature (optics) for more information on the sign convention for radius of curvature used here. An example of how lens choice affects angle of view. The photos above were taken by a 35 mm camera at a fixed distance from the subject. In this computer simulation, adjusting the field of view (by changing the focal length) while keeping the subject in frame (by changing accordingly the position of the camera) results in vastly differing images. At focal lengths approaching infinity (0 degrees of field of view), the light rays are nearly parallel to each other, resulting in the subject looking "flattened". At small focal lengths (bigger field of view), the subject appears "foreshortened". Camera lens focal lengths are usually specified in millimetres (mm), but some older lenses are marked in centimetres (cm) or inches. Focal length (f) and field of view (FOV) of a lens are inversely proportional. For a standard rectilinear lens, FOV = 2 arctan x/2f, where x is the diagonal of the film. When a photographic lens is set to "infinity", its rear nodal point is separated from the sensor or film, at the focal plane, by the lens's focal length. Objects far away from the camera then produce sharp images on the sensor or film, which is also at the image plane. As s1 is decreased, s2 must be increased. For example, consider a normal lens for a 35 mm camera with a focal length of f = 50 mm. To focus a distant object (s1 ≈ ∞), the rear nodal point of the lens must be located a distance s2 = 50 mm from the image plane. To focus an object 1 m away (s1 = 1,000 mm), the lens must be moved 2.6 mm farther away from the image plane, to s2 = 52.6 mm. The focal length of a lens determines the magnification at which it images distant objects. It is equal to the distance between the image plane and a pinhole that images distant objects the same size as the lens in question. For rectilinear lenses (that is, with no image distortion), the imaging of distant objects is well modelled as a pinhole camera model. This model leads to the simple geometric model that photographers use for computing the angle of view of a camera; in this case, the angle of view depends only on the ratio of focal length to film size. In general, the angle of view depends also on the distortion. A lens with a focal length about equal to the diagonal size of the film or sensor format is known as a normal lens; its angle of view is similar to the angle subtended by a large-enough print viewed at a typical viewing distance of the print diagonal, which therefore yields a normal perspective when viewing the print; this angle of view is about 53 degrees diagonally. For full-frame 35 mm-format cameras, the diagonal is 43 mm and a typical "normal" lens has a 50 mm focal length. A lens with a focal length shorter than normal is often referred to as a wide-angle lens (typically 35 mm and less, for 35 mm-format cameras), while a lens significantly longer than normal may be referred to as a telephoto lens (typically 85 mm and more, for 35 mm-format cameras). Technically, long focal length lenses are only "telephoto" if the focal length is longer than the physical length of the lens, but the term is often used to describe any long focal length lens. Due to the popularity of the 35 mm standard, camera–lens combinations are often described in terms of their 35 mm-equivalent focal length, that is, the focal length of a lens that would have the same angle of view, or field of view, if used on a full-frame 35 mm camera. Use of a 35 mm-equivalent focal length is particularly common with digital cameras, which often use sensors smaller than 35 mm film, and so require correspondingly shorter focal lengths to achieve a given angle of view, by a factor known as the crop factor. Wikimedia Commons has media related to Focal length. ^ a b c John E. Greivenkamp (2004). Field Guide to Geometrical Optics. SPIE Press. pp. 6–9. ISBN 978-0-8194-5294-8. ^ a b Hecht, Eugene (2002). Optics (4th ed.). Addison Wesley. p. 168. ISBN 978-0805385663. ^ Hecht, Eugene (2002). Optics (4th ed.). Addison Wesley. pp. 244–245. ISBN 978-0805385663. ^ Jeffrey Charles (2000). Practical astrophotography. Springer. pp. 63–66. ISBN 978-1-85233-023-1. ^ Leslie Stroebel and Richard D. Zakia (1993). The Focal encyclopedia of photography (3rd ed.). Focal Press. p. 27. ISBN 978-0-240-51417-8. ^ Leslie D. Stroebel (1999). View Camera Technique. Focal Press. pp. 135–138. ISBN 978-0-240-80345-6.